Porter-Cable PCCK600LB cordless drill/driver is a handy tool that can be used for completion of various repair or construction tasks. The model works with bits that fit securely into the 0.5-inch keyless chuck. In addition, this battery powered device reaches rotational speed of 1600 RPM. Its weight is 3.5 lbs. item 5 Porter-Cable PCCK600LB 20V Li-Ion 1/2" Cordless Drill/Driver NEW! 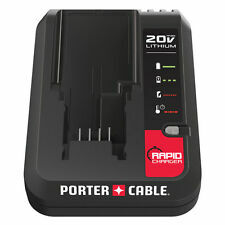 -Porter-Cable PCCK600LB 20V Li-Ion 1/2" Cordless Drill/Driver NEW! PORTER-CABLE PCCK607LB 20V MAX Brushless Cordless Drill Driver, 1/2"
PORTER-CABLE PCCK607LB 20V MAX Brushless Cordless Drill Driver 1/2"
porter cable 20 volt drill. Great tool loads of power fast charger!!!! Well built and like the metal mandrel. Received fast and great quality. It’s an excellent drill. No experience. Drill broke right out the box. Received the drill and it was broke right out of the box. Took it to the local authorized repair center to get it fixed and they did not have the part and it was out of stock from Porter Cable's parts department. It was just a cheap plastic part that was broken. It was going to cost too much to send it back and their service center seemed to be the best option. It has been over six weeks and still not repaired. I think the drill will be ok if they can ever get it to work. Very satisfied with the product and have no regrets about purchasing it.